I wasnt sure where to post this thread...perhaps mixoff could create a vst plugin section or something. 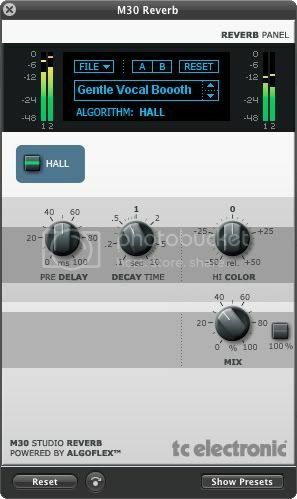 TC Electronic were giving this reverb away in January 2010...I kept the links to the downloads and I just checked them and I think they still work. At first I wasnt sure if I liked this reverb however Ive started using is more in my mixes lately and it is a nice sounding reverb if used properly...has a nice warm quality to it. Just tried it out last night, sounds good, seems pretty straightforward! It's always nice to add another tool to the toolbox, especially for free! I like the simplicity of this reverb plug...Its my main verb right now in regards to mixing...If I use as a send recieve I usually add a gate plug and eq plug as well for even more control over the reverb. Adding a gate and eq is a tip I learned from that David Gibson mixing video. Very cool!!!! Thank you so much for the link!!!!! I am new to mixing. If I make a suggestion don't take offense. I'm trying to learn and develop my ears. Take everything I say with a grain of salt while I get better. Thanks. I just tested the download links and they still work...also opened the reverb in a project of mine and it also still works fine. I would try again...maybe the links were down for a brief moment. No worries i already downloaded it weeks ago. Yeah you figuer they would kill the download links after giveaway was over...perhaps they just dont care if people keep downloading it. I will use the links as long as they work...had a few computers die on my in the last year so when I went back to links to download verb again and they still worked I thought I would share the active download links...maybe not the coolest thing to do by me however all they have to do is kill the links if they want to stop access to download.